9 Commercial Real Estate & Properties in Stanmore are listed in 3 categories. We have 5 OfficesSale & Lease , 3 Retail ShopsSale & Lease and 1 ShowroomsSale & Lease . Natural Light | Fully Furnished | Bike Racks & Showers $250pw | 1 Person Workspa..
PROPERTY OVERVIEW $250pw Price incl. Medical consulting rooms for rent on flexible terms in Sydney’s Inner West. Join a vibrant multi disciplinary medical clinic with an established 20 year customer base and benefit from a quality consulting space, rehab areas, a professional reception team and on site parking. Everything that will streamline your processes is already set up – EFTPOS, HICAPS, fast internet, SmartSoft FrontDesk database system, aircon and herbal dispensaries plus modern kitchenette and toilets. A fantastic consulting space perfect for myotherapists, TCM practitioners, massage therapists, physios, psychologists, speech therapists, occupational therapists, kinesiologists and other health professionals seeking a friendly and welcoming practice. This striking Stanmore building holds a prominent corner position on Parramatta Road with great visibility to tens of thousands of drivers every day. 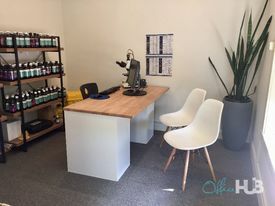 This City Fringe/Inner West location is one of the most convenient locations in Sydney and makes your practice easily accessible for clients from every corner. Originally a bank, the converted building was purpose fitted 12 years ago with practitioners’ needs and patient flow in mind and it has been immaculately maintained ever since. The advertised office space is perfect for a team of 1. If you need more or less space, we have over 30,000 furnished workspaces all over the world suitable for a team of 1 to 200+. Our award winning team offer a free service that will help you find the perfect solution for your needs, so reach out if you need more help. What you get for your weekly rent , Access to kitchen facilities , Building outgoings included , Flexible terms , Regular cleaning , Telephone provided , Your own receptionist and waiting area for your clients , Access to secure printer and scanner , Commercial grade internet (Free) , FREE Parking Building features , Air conditioning , Bike racks , Car parking in building and surrounding areas , Disabled facilities , Natural light , Showers , Direct access to public transport , Company Branding in Foyer & Reception , Direct access to buses , Taxi / Uber stand close to building 10m to 909 and M92 bus stop 500m to Homebush and 900m to North Strathfield and Flemington train stations 3km drive to Sydney CBD WHO IS OFFICE HUB? Office Hub has largest collection of shared office space, sublet office space, creative coworking office space and serviced offices, perfect for 1 200 employees. Let us take you on a tour of all the spaces that fit your needs and budget. Our service is complimentary and we work for you and the landlord to negotiate the most competitive deal in the market. Let us show you how shared and serviced offices can be the perfect solution for your business. All pricing shown excludes any local taxes such as GST or VAT Conditions apply A portion of the square meterage factors in access to shared space. The advertised price includes any incentives offered based on a 12 month agreement. If a shorter period is agreed to please note the price may increase accordingly. This promotional offer for new tenants only and may be withdrawn at any time due to space availability. Warehouse Style Creative Space! 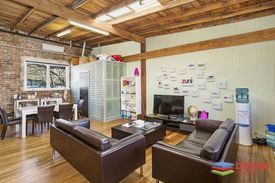 $550 PW + GST + Electrici..
Natural Light | Fully Furnished | Bike Racks & Showers $230pw | 1 Person Workspa..
PROPERTY OVERVIEW $230pw Price incl. Medical consulting rooms for rent on flexible terms in Sydney’s Inner West. Join a vibrant multi disciplinary medical clinic with an established 20 year customer base and benefit from a quality consulting space, rehab areas, a professional reception team and on site parking. Everything that will streamline your processes is already set up – EFTPOS, HICAPS, fast internet, SmartSoft FrontDesk database system, aircon and herbal dispensaries plus modern kitchenette and toilets. A fantastic consulting space perfect for myotherapists, TCM practitioners, massage therapists, physios, psychologists, speech therapists, occupational therapists, kinesiologists and other health professionals seeking a friendly and welcoming practice. This striking Stanmore building holds a prominent corner position on Parramatta Road with great visibility to tens of thousands of drivers every day. This City Fringe/Inner West location is one of the most convenient locations in Sydney and makes your practice easily accessible for clients from every corner. Originally a bank, the converted building was purpose fitted 12 years ago with practitioners’ needs and patient flow in mind and it has been immaculately maintained ever since. The advertised office space is perfect for a team of 1. If you need more or less space, we have over 30,000 furnished workspaces all over the world suitable for a team of 1 to 200+. Our award winning team offer a free service that will help you find the perfect solution for your needs, so reach out if you need more help. What you get for your weekly rent , Access to kitchen facilities , Building outgoings included , Flexible terms , Regular cleaning , Telephone provided , Your own receptionist and waiting area for your clients , Access to secure printer and scanner , Commercial grade internet (Free) , FREE Parking Building features , Air conditioning , Bike racks , Car parking in building and surrounding areas , Disabled facilities , Natural light , Showers , Direct access to public transport , Company Branding in Foyer & Reception , Direct access to buses , Taxi / Uber stand close to building 10m to 909 and M92 bus stop 500m to Homebush and 900m to North Strathfield and Flemington train stations 3km drive to Sydney CBD WHO IS OFFICE HUB? Office Hub has largest collection of shared office space, sublet office space, creative coworking office space and serviced offices, perfect for 1 200 employees. Let us take you on a tour of all the spaces that fit your needs and budget. Our service is complimentary and we work for you and the landlord to negotiate the most competitive deal in the market. Let us show you how shared and serviced offices can be the perfect solution for your business. All pricing shown excludes any local taxes such as GST or VAT Conditions apply A portion of the square meterage factors in access to shared space. The advertised price includes any incentives offered based on a 12 month agreement. If a shorter period is agreed to please note the price may increase accordingly. This promotional offer for new tenants only and may be withdrawn at any time due to space availability. Freestanding showroom and office building. Prominent position with high visibility and great signage opportunity. Creative first floor space with exposed timber beams. Loading Dock at rear with wide roller door entrance making it easily accessible. Ground floor 302 sqm First Floor 255 sqm Whole Building of 557 sqm approx This is a strong Parramatta Road location with range of quality home wares, fashion and automotive occupiers located close by.